Linné on line – Opium – a latex from Hell? Linné on line Linnaeus and Pharmacy Medicinal plants Opium – a latex from Hell? 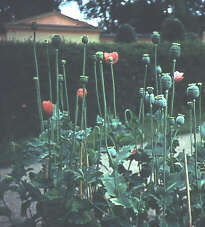 Opium poppies used to be grown in the Linnaeus’ Garden, Uppsala. The medicinal effects of the opium poppy have been known for several thousand years. The milky juice was seen to be sleep-inducing which inspired Linnaeus, when he named the plant Papaver somniferum. Somniferum means soporific. The word opium comes from the Greek opos which meanslatex and the name morphine comes from Morpheus, the Greek god of sleep. Opium was being used in Europe as early as medieval times. When Europeans colonised Asia, the Portuguese took over the trade in opium between India and China. People in China started smoking opium for pleasure as well as for its medicinal qualities. Smoking opium involves inhaling a dry opium distillate. The opium smoker falls into a torpor and experiences pleasant dreams. A moderate opium smoker will spend a large part of the day being intoxicated and afterwards he will exhibit very little interest in his surroundings. Long term use of opium is said to lead to a dulling of the intellect. It has long been known that opium is dangerous and should be used accordingly. The dose is therefore extremely important. Pharmacies used to sell Opium Tincture, opium dissolved in alcohol for internal use against panic attacks or diarrhoea. This is because opium, apart from its soporific properties, also slows down peristalsis – the movements of the colon. The colon is anaesthetised, so reducing the diarrhoea. When you score an unripe opium poppy capsule, a white milky latex runs out. This blackens as it dries. It is what we call opium. Chemistry had progressed so far at the beginning of the 19th century that chemists could extract and refine medically active substances from opium. The first time the principal component, which was named morphine, was isolated, was in 1803. Then in 1818 another substance was found that was given the name narcotine. Here too opium’s narcotic – sleep inducing properties – have had a role to play. The name was later changed to noscapine. The substance codein was first refined in 1832 and the name is inspired from the Greek word for poppy head, kodeia. In 1848 papaverin was isolated. Its name is derived from Papaver which is Latin for poppy. 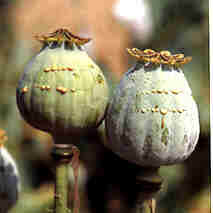 The active substances in the latex of the opium poppy are of a type which is known as alkaloids. Many opium alkaloids are still used in modern health care for symptoms that were formerly treated with opium. The most well-known of these is morphine which is an analgesic. It is addictive and is therefore used restrictively. Instead codein is used more and more frequently. Codein also has analgesic properties but it is not so addictive. Papaverin is used in modern medicine as an antispasmodic for the relief of cramp. This effect of opium was described early in a Swedish book of herbs from the 17th century where it states that, “Opium in relatively large amounts relieves cramp (if the amount is too large, it is lethal).” In the same book you can read, “Opium relieves Coughing” and nowadays noscapine is used in certain cough medicines. Codein, too, gives cough relief. Morphine has also been modified as ethylmorphine, which is found in certain cough medicines. But the most famous, or rather notorious, semi-synthetic morphine derivative is heroin, a very potent cough relief, but which is rightly no longer considered suitable for use within medical care.